Uniting different cultures and art at the invitation of the government of Sharjah, UAE. Under 'The Eye of the Emirates' at Al Oasha, as part of the many Sharjah Calligraphy Biennial events, a workshop took place on the 3rd April 2012 called "Big Calligraphy Brush" that was lead by renowned Japanese calligraphy artists including master Sugi Yayoi as she is pictured in a red blouse below. Among other artist, Tashi Mannox was invited to create a giant calligraphy piece; here choosing a suitable brush and bucket of Japanese Sumi ink with the help of Sugi Yayoi. Only after taking a moment to blow a wondering insect from the enormous paper, Tashi deliberated the first mark with a certain gusto. 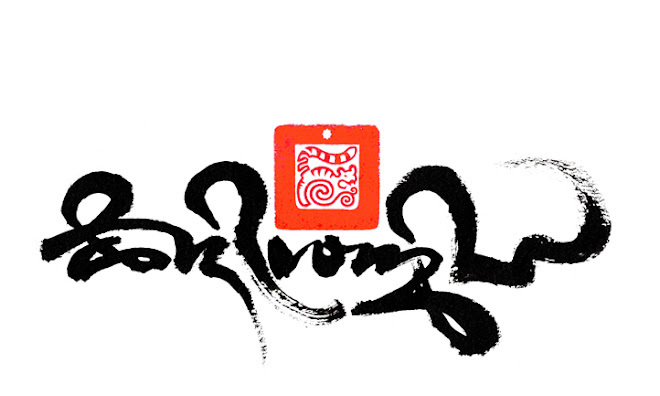 The first letter of the calligraphy is the Tibetan letter cha ཆ་ formed in one continuous brisk stroke. Sugi Yayoi applauds ! 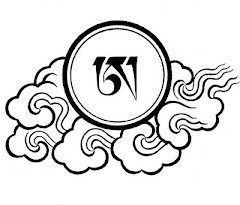 Below which a 'ü' vowel sign is added to complete the word chü ཆུ་ meaning 'water'. The end of the vowel sign is artfully lengthened as if the flow of water or waves, ending with a fine wisp. And the final gesture is his signature, and with the absence of his personal seals the calligraphy was finished with three fingered print in red cinnabar seal ink. symbolizing three jewels. 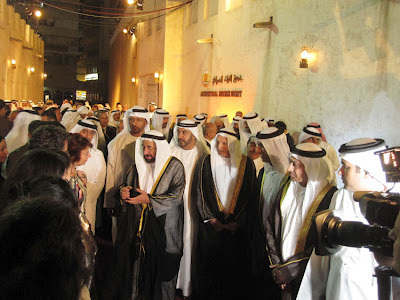 Another guest to create a giant Islamic calligraphy was a noble Sheikh and participant of the Sharjah Calligraphy Biennial 2012, who managed with great care not to get a single drop of black ink on his pristine robes. A trend of marking the finished calligraphy with a red finger-print seems to have been set by Tashi, as this noble Arab takes great delight in his finished work.